When I was a monk, I often found myself feeling as though freedom was just out of reach. Possible, but on the horizon. My longing for liberation fueled me, yet my experience was that there was always more struggling to address along the path to it. More karmic knots to untie. This perception kept me firmly rooted in the illusory role of the samurai — always on the lookout for obstacles, willing to risk it all for freedom. Unafraid, perhaps even slightly eager, to come upon the next enemy. The next internal demon. To slash them. I don’t regret that time, and, I’m certainly grateful to have the clarity now that the samurai is just one aspect of my personality. No more true or valid than any other. That that approach to practice is based on the idea that there is a separate self that awakens. That there’s work, hard work, to be done to ensure that awakening is possible. This perspective is no longer my experience of practice. When One House of Peace formed, to some degree, it was the vision of an oasis. The calm in the storm of the battle. A quiet place to rest my head after a day of fighting the demons of my own inner landscape, ferreting out the roots of my suffering to cut them off before they had opportunity to sprout. I had left the monastery where I trained and was living in Sacramento to be near a mentor. Staying in a friend’s home while they traveled to France. At that time, being vigilant about a structured sitting schedule was deeply supportive and nothing kept me from it. Having lived in the monastery for eight years I knew the value of structure. I knew the way it anchored me. I was clear about how it grounded me. Jim and Julia were due to return from France soon and I had to find a place to live. Mostly to support my own practice, and for accountability, I held the intention to invite others who wished to sit with me to do so. I had the vision of an open space in which I might have a small bedroom (I owned virtually nothing at the time) with the majority of the building being available to community members for practice. I put up signs. Every Sunday I met whomever showed up at the Cottage Garden at 10am to discuss possibility around this vision. Over the weeks, the group grew. Chatting regularly about what could be. Until the Sunday that Roberta strolled in. And we were off. “Yes” became a mantra of sorts. Possibility flowered. As a small community formed, offerings expanded. No one was ever turned away due to lack of funds. At one point, it became clear that if we had a non-profit status, folks who contributed to the vision of our sustainability and expansion could receive the benefit of a tax write-off. We followed through. Folks from the One House of Peace community in 2010 in Sacramento, CA. 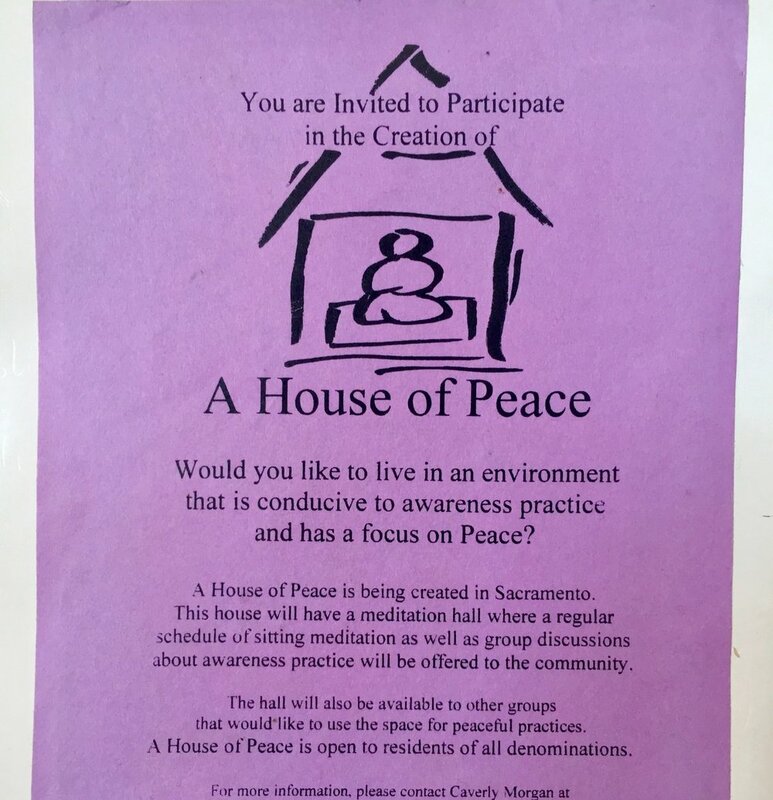 A full decade later, One House of Peace has relocated, expanded, launched Peace in Schools, has a staff of 13, and supports a thriving community of practitioners. While the name One House of Peace has always deeply resonated with me, on some level we’ve outgrown it. It served its purpose. We’re entering a new era. We’ve seen the fall out of “I” centered movements in our world. We’ve watched hate lead to more hate. Divisiveness lead to further divide. Separation begetting separation. The collective movement from "I" to "we". The embodiment of teachings that speak to the truth of our oneness, on both the absolute and relative realms of existence. Presence is the blood, the life-force of these two medicines of our time. Hence, Presence Collective. The perfect new name for who we are and where we are in this moment. Presence Collective leading to Collective Presence. Regarding the first medicine, I believe we’re outgrowing the model in which the teacher is presented as all-knowing, perfected, with the students, by default, left to swim through a sea of seeking and even lack — freedom in the distance on the horizon. It is time to create models that allow everyone’s light to shine brightly. There has been, and always will be, only one light. Yes, of course it is helpful to have guides who are dedicated to bringing teachings into the world, if that is their song to sing. It has been mine. Not only during my time as a monk, but for the last 10 years as I’ve lived beyond the monastery gates. I’ve sung. I’ve never sung in isolation and I’m especially not in isolation now. 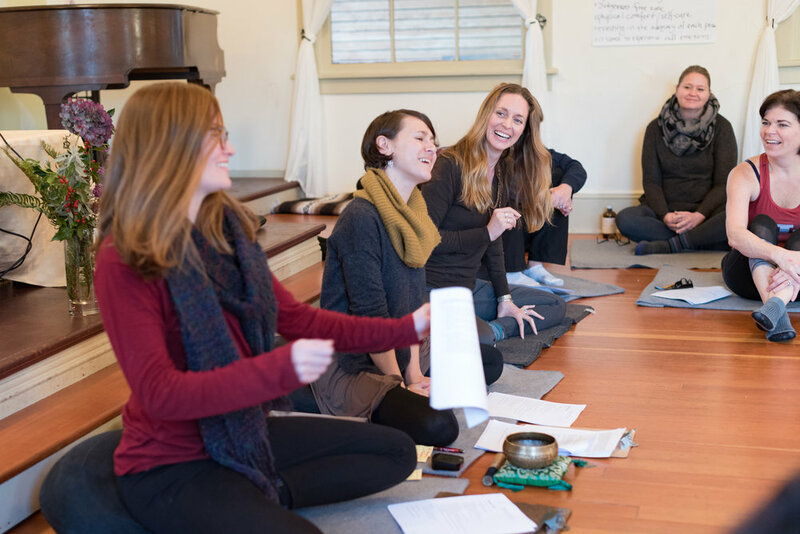 Not only are there 13 sincere practitioners on payroll, there’s a thriving community that benefits from and contributes to the practice offered through One House of Peace. Many have worked with me for years and are now sharing practice with others in new and creative ways. Whether we changed our name or not, we’re a collective. There are many singers and the songs vary, yet we are united through a practice of presence. We don’t see Presence Collective as a membered club. It’s a larger and more inclusive vision than that. This platform offers a way for us to host sages, visionaries, leaders and teachers from other communities as well. Again, even without the new name, it’s where our ship has already been heading. 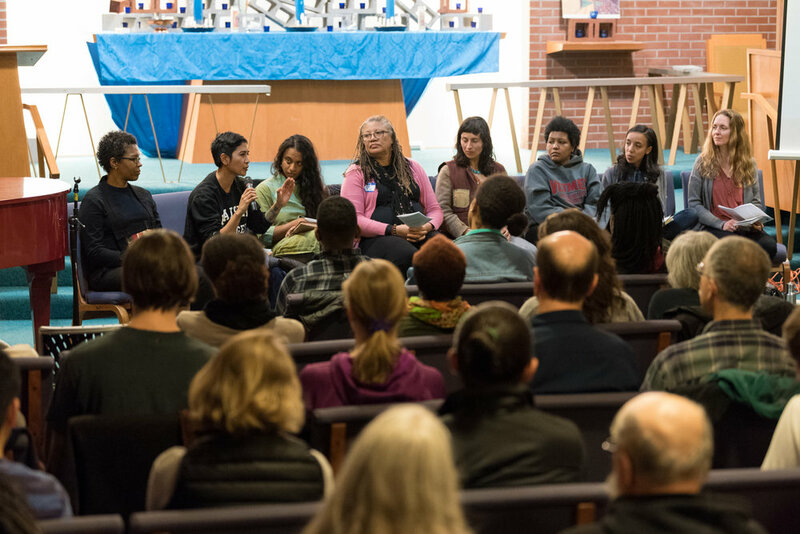 In November, we co-hosted Reverend angel Kyodo williams to facilitate a weekend of Radical Dharma. In December we hosted former monk Dave McKay, who I trained monastically alongside for eight years. In 2018 we look forward to offering a microphone to more singers. Diverse tunes. Different songs. Various entry points to practice. At the core, the same hymn. The song of we, of love, of the recognition of our oneness and the commitment for our actions to be on behalf of, and in service of, that recognition. Caverly Morgan, Peace in Schools' teacher Madeline Harmon, and Peace in Schools' Advisory Board member Tuere Sala on a panel discussion with angel Kyodo williams. Regarding the second medicine — the embodiment of teachings that speak to the truth of our oneness on both the absolute and relative realms of existence. I believe our world benefits from the recognition that we need not see the teachings that focus on the absolute (the fundamental nature of our true nature) as separate from the teachings that bring about peace on the relative (unpacking systems of oppression, being advocates for the voiceless animals of this world, etc.) It’s not required or necessary to focus on one or the other. The line between the two is a creation. For some, the entry point to a practice of presence is through the door of the relative plane. Perhaps they found mindfulness at a doctor’s recommendation because they wanted to relieve stress. A progressive pathway is well-suited. It meets them where they are. It offers a way to create change in the world around them. Bringing about peace where there has been conflict. Sewing love where there has been hate. Others have experiential understanding of their inherently awake true nature and wish to have practice be a way to align all aspects of life with this realization. The direct approach to practice is clean and efficient. And, of course, for some, both are true at the same time. This is so because there is no separation. All pathways, and non-pathways, are arising, resting in and known by the same consciousness. Only the conditioned mind looks at these approaches in a linear fashion. In truth, there is no duality here. Open, infinite awareness has room for all of it. Sees all of it as various forms of love. As outpourings of the infinite possibility that life offers. And so the flowering continues. Jim and Julia, who shared their Sacramento home with Caverly after she left the monastery, on our New Year's 2017-18 retreat. With each new hire to the organization, in the interview process I’m always sure to ask, “What lights you up?” And now, I turn that question to you. If you are reading this, you’re part of this journey should you wish to say “yes” along with us. We’d love to hear from you. What, if anything, lights you up about this vision? What song is uniquely yours to sing? Presence Collective is embodying the recognition of our oneness. We’re moving through the world, acting on behalf of it. Together, remembering the truth of our interconnection and supporting others in doing so. Singing, out of joy and out of love, the songs that are uniquely ours to sing. United by what’s most fundamental — most inherent — most vibrantly alive in the direct experience of who we authentically are: presence.